Review: After nearly forty years of marriage, a wife questions her life choices as she travels to Stockholm with her husband. He is about to be awarded the Nobel Prize for Literature. They have shared a lifetime of compromises, secrets, betrayals and mutual love. Based on the novel of the same name by Meg Wolitzer. What I liked about this was in the first few minutes of the film the story is explained and set up for the viewer. You are immediately into the film and know what it is going to be about. A really strong performance from Glenn Close. You only have to see her face in order to know what she is thinking. 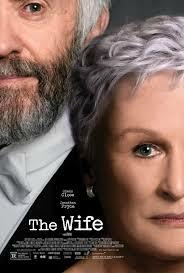 Apparently Glenn Close approached Gary Oldman for the role of Joe (her husband) but he was unavailable for the role. Jonathan Pryce also gives an outstanding performance, but I feel that he has been sidelined, with Glenn Close is getting all the attention. It is a joint performance and they should both get the same credit. I was also impressed with Max Irons’s acting. Other TV/film work I have seen him in I have been disappointed with, but it shows that given the right film/director how well these actors can do. There are scenes where there are flashbacks to the younger Glenn Close; this is played by Annie Starke who is Glenn Close’s daughter. This is a film that I would quite happily see again and would understand a lot more/find out more secrets beforehand etc. This has quite a few themes involving pride and regret. The development process for this film took fourteen years and I have to say it was well worth the wait. At the Golden Globe Awards in 2019 Glenn Close won for Best Performance by an Actress in a Motion Picture – Drama.